Break off ¼ of the CandiQuik bar and set aside in a mug or small bowl. Melt remaining CandiQuik in the microwavable tray according to package directions. Once melted, add orange candy color until desired color is reached. Coat Nutter Butter cookies in orange CandiQuik (I like to use two forks to do this) and set on waxed or parchment paper, add two candy eyes, and allow to dry. Melt ¼ set aside in a mug or small bowl for 45 seconds followed by 15-second increments, stirring between each increment. Once melted, add yellow candy color until desired color is reached. Pour yellow CandiQuik into a pastry bag or Ziploc bag with a small corner cut off. 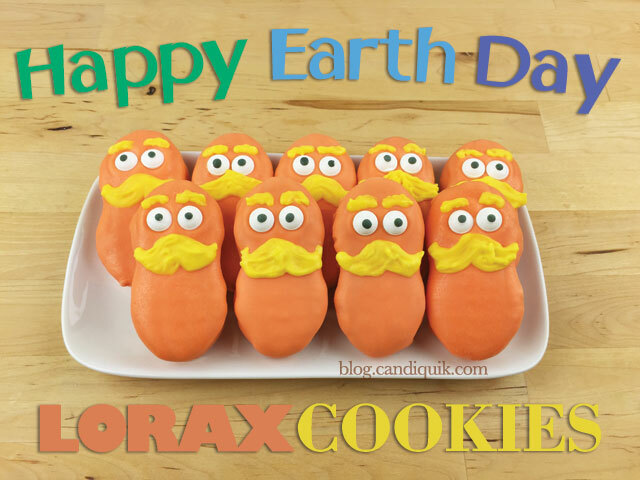 Pipe Lorax mustache and eyebrows onto cookies and allow to dry.